The Quintin Hogg Memorial Ground, informally known as the Polytechnic Ground, is a major sports centre in Chiswick, West London. The ground was opened in 1906, and it now includes floodlit synthetic turf pitches, netball and tennis courts, and natural pitches for cricket, rugby, and football. Quintin Hogg, for whom the ground is named, was an amateur sportsman, businessman, educational reformer, and philanthropist. He is best known for founding The Polytechnic (later known as the Polytechnic of Central London (PCL); now the University of Westminster). His descendants include three generations of Conservative politicians. A carefully restored sign states that the sports grounds are “for the recreation of members and students of the Polytechnic 309 Regent Street London W1”. The 40-acre site became the home of the Polytechnic Harriers athletics club, and it also hosted football, cricket, and tennis clubs. These clubs drew large crowds to their events, so in 1938 the grounds were expanded by the purchase of an additional 20 acres for an athletics stadium comprising a cinder running track and a state-of-the art cantilever stand. The Modernist-style grandstand was designed inhouse by Joseph Addison, head of the Polytechnic’s School of Architecture. The roof is supported by a beam 78 feet long by 7 feet deep, which in turn is supported by two octagonal pillars. The front section of the roof projects a further 30 feet over the lower seating deck. The stand seats 658 spectators and additionally houses offices, club rooms, and dressing rooms. It was hoped that the stadium would become London’s principle athletics venue, but the intervention of the war and the opening of the National Sports Centre at Crystal Palace in 1964 meant that these hopes were never realised. By the 1970s, cinder tracks had fallen out of favour as all-weather surfaces came into use, and the Polytechnic Stadium fell into decline. In 1985, the male-only Harriers merged with the women’s Kingston Athletics Club and moved to Kingston. The by now run-down stadium was partially renovated for use by Fulham Rugby League Football Club (originally a spin-off from Fulham FC, now known as London Broncos), who played there from 1985 to 1990, but plans for a permanent move fell through. The grandstand, now a Grade II listed building, was eventually restored, but the revamp left it flanked by a fitness centre and a health club that HRH Prince Charles would certainly classify as carbuncles. The former cinder track has been turfed over, but is unused as a playing-area, with the consequence that the stand’s seating area likewise is unused. In addition to the Polytechnic stadium, the grounds also incorporate a large pavilion with two function rooms, catering facilities, bars and changing rooms. The sentry-box style cricket scoreboard, sadly, is no longer in use and has been superseded by an electronic scoreboard mounted on the pavilion. These days, nearly all modern sports stadia offer spectators a column-free view of the action. One of the most common ways of achieving this is by roofing a grandstand with a cantilever roof. The first cantilever stand at an English football ground was the one at Scunthorpe United’s Old Showground, opened in 1958. Much larger cantilever stands soon followed at Hillsborough and Old Trafford, although stands with column-supported roofing continued to be built for many years afterwards. In fact, even in the 1950s, cantilever stands were nothing new. They first appeared at continental racecourses as early as 1906, but it was not until the late 1920s that they found their way to Britain. One of the earliest still existing was built for University College School Old Boys’ Rugby Football Club at Macfarlane Lane, Isleworth in 1935. Constructed from reinforced concrete and featuring Crittall windows, it was designed by club members Brian Sutcliffe and HC Farmer. In 1968, the ‘Old Gowers’ entered into a groundshare with Centaurs RFC, who had been forced to leave their home at the Lyons Sports Ground, Sudbury after it was sold by its owners, J. Lyons and Co. The ‘Old Gowers’ subsequently left in 1979, preferring to use the more centrally-located playing fields of their parent institution in Hampstead. Centaurs continued to use the ground alone until 2000, when rising costs forced the club to move to Richmond and rent a council-owned pitch. Thereafter the stand fell into disrepair. In 2001, it was designated a Grade II listed building, and two years later it was placed on the Heritage At Risk Register. However, in 2005, the ground was taken over by a five-a-side football company, and in 2010 a £1.5 million refurbishment of the stand, its bar, and rear pavilion was completed. 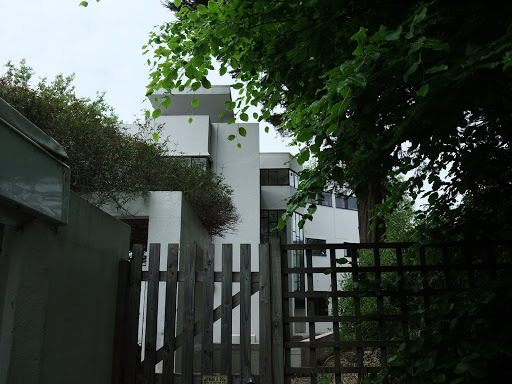 Restored to its former glory, it is a fine example of Modernist architecture, although there is now very little action to be seen from its bench seats. In order to preserve its setting, the enclosed five-a-side pitches were sited some way away from the stand. The turf fronting the stand is used only occasionally for football. High and Over is a Grade I listed building in Amersham, Bucks. 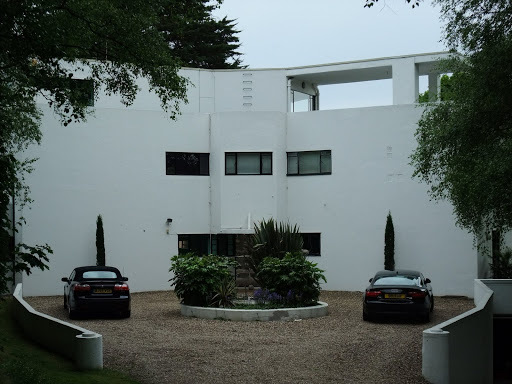 Designed by Amyas Connell and built in the late 1920s, the Y-shaped country house and the smaller Sun Houses nearby were controversial at the time, but are now admired as fine examples of the Modernist style. Originally a single dwelling, High and Over was divided into two units in the 1960s. Local legend has it that the building had to be camouflaged during World War II because enemy bombers were using it as a landmark to help them find their targets. 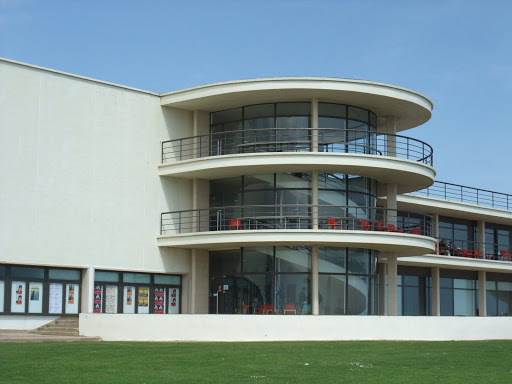 Constructed in 1935, the De La Warr Pavilion in Bexhill, East Sussex was one of Britain’s first Modernist public buildings. 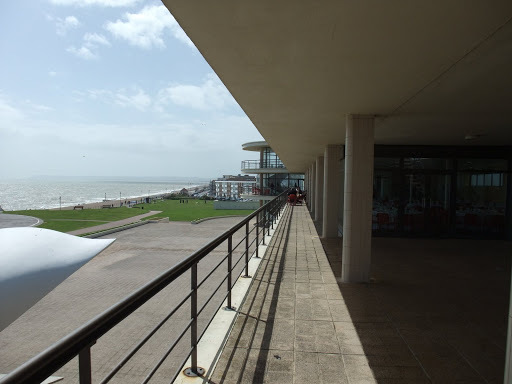 The seafront building was the brainchild of Herbrand Sackville, 9th Earl de la Warr, Mayor of Bexhill. 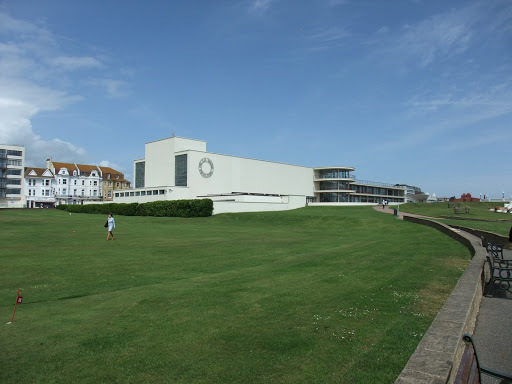 The Earl, who was a socialist, persuaded Bexhill council to develop the site as a public building. A competition was announced in the Architects Journal in February 1934 and run by the RIBA. The requirement was for an entertainment hall to seat at least 1500 people; a 200-seat restaurant; a reading room; and a lounge. Erich Mendelsohn and Serge Chermayeff were selected from over 230 entrants. Construction work began in January 1935 and the building was opened on 12 December of the same year. The building was damaged when a nearby hotel was bombed during the war and it was neglected during the postwar era. However in 1986 it was awarded Grade I listed building status and three years later a Trust was formed dedicated to restoring the building to its former glory. These efforts were eventually successful and with the aid of a £6 million Lottery grant the building was restored and converted into a contemporary arts centre. This opened in 2005, as the building marked its seventieth anniversary. 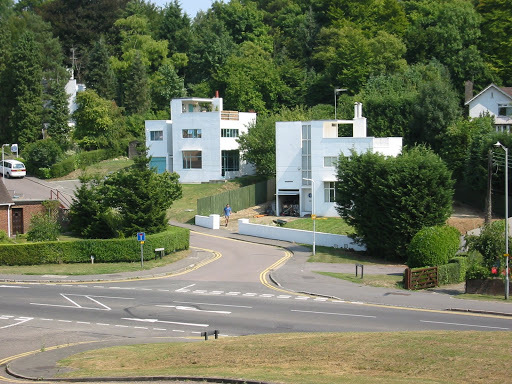 The Sun houses of Highover Park, Amersham were a later addition to the Amyas Connell-designed High and Over apartment complex. John Betjemin initially described them as “scandalizing all Buckinghamshire”, but later became a fan. 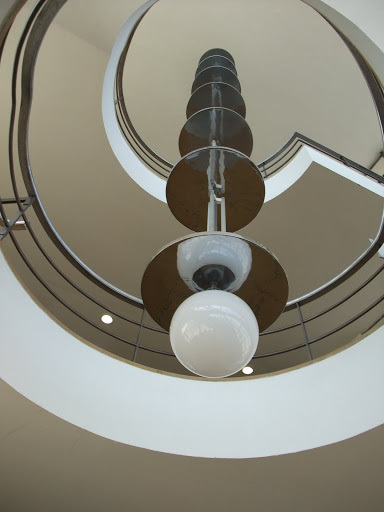 The buildings are now all regarded as classics of the Modernist style. 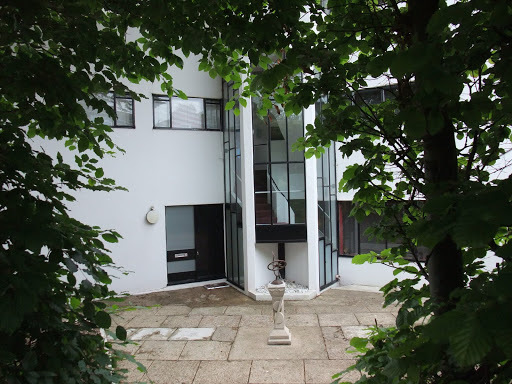 Although not one of London’s better-known Modernist buildings, 66 Frognal in Hampstead is nevertheless an outstanding example of the style. 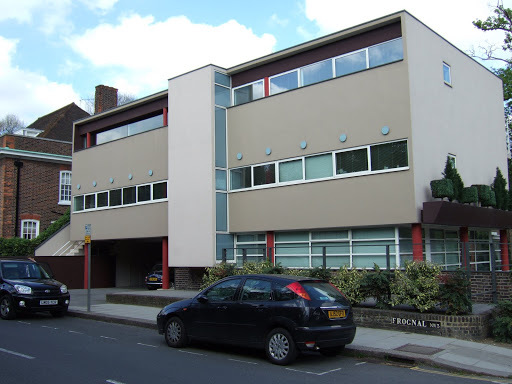 It was built in 1938 and designed by British architect Colin Lucas (1906-1988), who was a partner in the practice of Connell, Ward and Lucas. New Zealanders Connell and Ward had earlier collaborated on the acclaimed High and Over complex in Amersham before Lucas joined them in 1933. The practice went out of existence when the war broke out the following year. After the war Colin Lucas joined the London County Council, working in the architecture division until 1977, when he retired.